I’ve spent most of my professional life designing, creating and maintaining websites. If there’s one thing I know for sure, it’s this: There’s always more to learn. The problem isn’t finding web-related subjects to learn about. Instead, the problem is finding an easy, efficient and reliable source of information. TutsPlus.com is one site many designers and web junkies turn to. 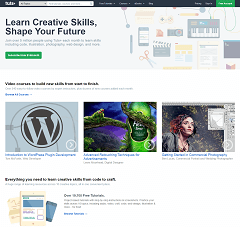 The site offers a huge selection of tutorials, videos and other instructions in basically every subject related to graphic arts, coding and website creation. I bought a one month subscription to TutsPlus and combed through their wealth of material. Does TutsPlus make the grade, or are these classes worth skipping? Check out my full review below. The variety is impressive. Basically any aspect of design, programming or graphic arts is covered in some way on the site. Coding has probably the most material with about 200 courses. Web design is second with about 90 courses. Overall the site has over 19,680 free tutorials, 530 courses and 190 eBooks. These numbers are always growing. Their team of producers, editors and instructors creates about 200 tutorials, 30 courses and 10 eBooks each month. TutsPlus was created in 2007 with a few tutorials on illustration and Photoshop. Over the years, the site grew into a network of 15 educational sites. These sites were combined into one – TutsPlus – in 2014. Multiple ways to learn. Courses typically include about two to three hours of video. I found them to be a great introduction to any topic I was unfamiliar with. For more in-depth study, I use the eBooks. They were very well-written and provided lots of advanced knowledge. This combination of video and eBooks worked great. I could learn what I needed to know, at the level I needed to know it, with ease. Expert opinions. Not just anyone can teach at Tuts. You have to actually know what you’re talking about. This already gives Tuts a huge advantage over a typical forum. Plus, the Tuts team edits and approves all material before it goes live. This creates a nice uniformity to the site. The classes are all structured in relatively the same way. Great Introduction. 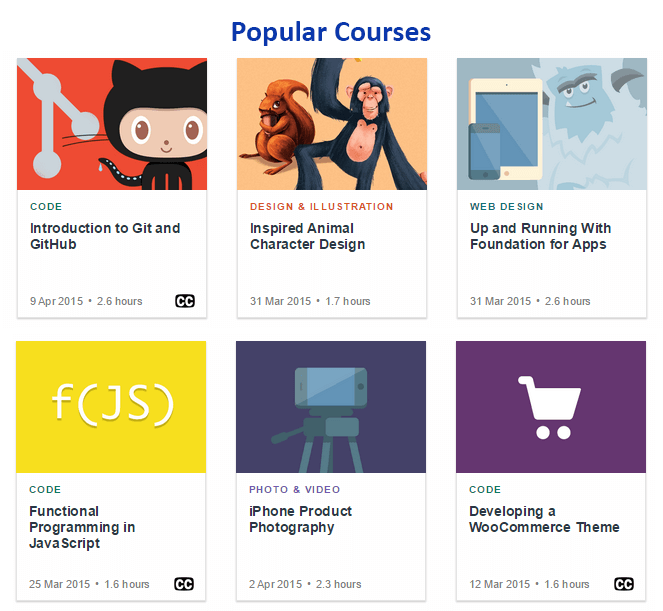 One thing I really liked about TutsPlus is they always have courses available for the absolute beginner. When I need a quick overview of a subject, I turn to Tuts. I know the information will be accurate and reliable. If I need to delve further into a subject, I usually just stay with Tuts for more advanced courses, too. Personalized instruction. You access the courses through a MyCourses page. This page keeps track of the courses you’ve watched, so you can re-watch them with ease. Plus, because the courses are in written and video form, you can start and stop them whenever you like. Pay for what you need. 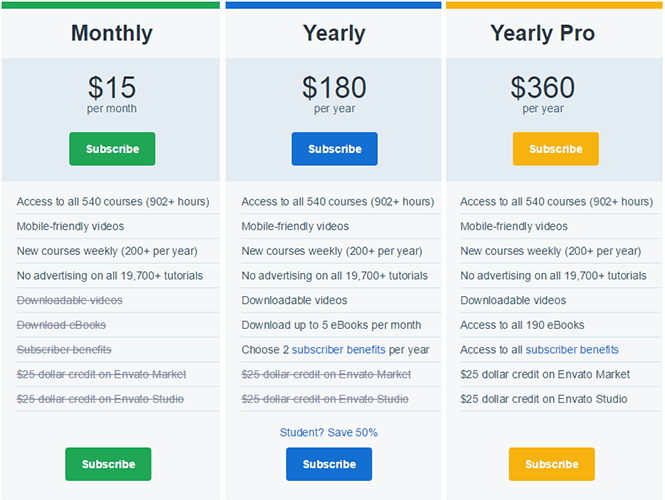 There are affordable subscription plans, which are detailed below, but the general idea is that you can only buy access to the material you want. Instead of a site-wide subscription, you can purchase “bundles” for a one-time fee of $45. Some examples include “Graphic Design Essentials” and “Hands-on Video.” Bundles include video courses, eBooks and more. This plan grants you access to all courses and mobile-friendly videos. You can also access the tutorials without advertising. This includes everything in the monthly plan plus downloadable videos and the ability to download up to five eBooks a month. You can also choose two subscriber benefits each year. There are over 20 benefits available. They’re mainly discounts on merchandise and services related to web design or coding. This includes everything in the yearly plan except you now get unlimited access to all eBooks (there are currently around 200 eBooks total). You also get all the subscriber benefits. Plus, you get a $25 credit on Envato Market and another $25 credit for Envato Studio. Everything in the Tuts site is great. The uniformity and accuracy of the material was never a concern. On the other hand, this wasn’t always the case with some of the external resources. Most courses link out to external resources, and they weren’t always great. For instance, during a coding course, one coding challenge contained a bug. This wasn’t the fault of the site, exactly. They had no control over the external site which hosted the challenge. Still, it was a bit of a pain. Fortunately, the vast majority of the instruction is directly in the Tuts material, and that always have very tight quality controls. 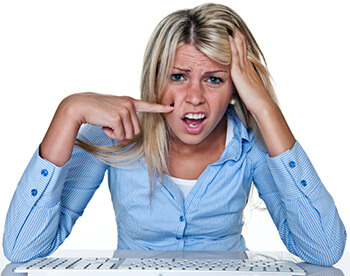 Customer support is limited to an email form you can access from the home page. 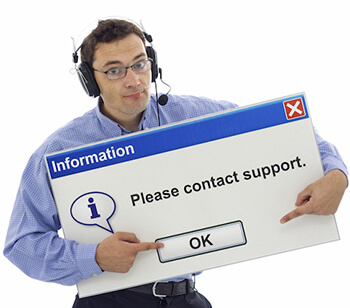 However, there’s not a real need for much technical support as far as I can see. The instructions are either written or on video. I found the site easy to navigate and never had any technical issues. For review purposes, I sent an email with a question about payment and heard back in just a few hours. Each course has a comment section. This is how you communicate with other students and the instructor. In the classes I took, I always found the comments to be very helpful. Whenever I was struggling with a particular subject, it was reassuring to read that other people also had similar problems – and they often later posted solutions. 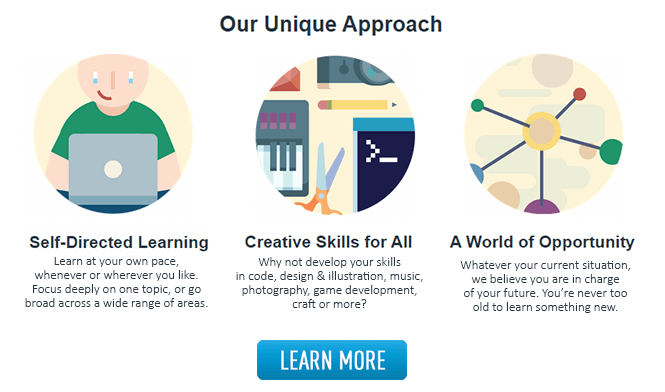 When it comes to web design, coding and graphic arts there’s always more to learn. But not all online instruction is equal. 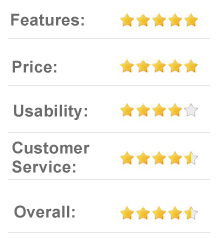 That’s probably my favorite aspect of TutsPlus: The info is reliable. The courses, eBooks and tutorials are all very polished and well done. Even complicated subjects such as coding were explained in a clear, engaging way. Obviously, each instructor is different but TutsPlus clearly has high standards when it comes to hiring. I found the video courses were great when I wanted an overview of a subject while the eBooks were better when I needed to get into the details. The site itself is easy to navigate. Courses flowed naturally into other courses, too. If you’re looking for a great educational resource for coding, design and graphic arts I absolutely recommend TutsPlus. The quality of the information is high while the price is low. There’s always more to learn and with TutsPlus I now have a trusted partner in knowledge.